During takeoff rotation, the left engine and strut assembly separated from the wing, and traveled over the wing, severing hydraulic lines in the associated area of the wing. Damage to the hydraulic lines caused a loss of hydraulic pressure and subsequent retraction of the outboard leading edge slats on the left wing. The flight crew reacted to the engine separation as if it were an engine failure, and they followed procedures consistent with that type event. In decelerating to the procedurally required V2 speed, the left wing stalled, as the prescribed speed was below the stall speed of the reconfigured wing. The resulting lift asymmetry caused an uncontrollable left roll and loss of control of the airplane. 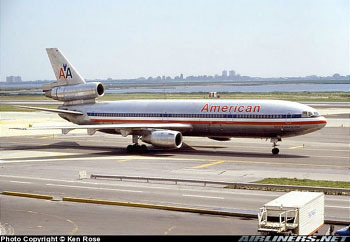 The airplane crashed inverted, killing all 271 passengers and crew. The National Transportation Safety Board (NTSB) determined that the probable cause of the accident was the asymmetric stall and ensuing roll following the uncommanded retraction of the left wing outboard leading edge-slats.